The game features many great animations from the characters in the game. To see them for yourself, either the play button on Google’s logo on the homepage, or click here to see some of the samples of test animations and see how the Doodle and game were built with designs along the way. 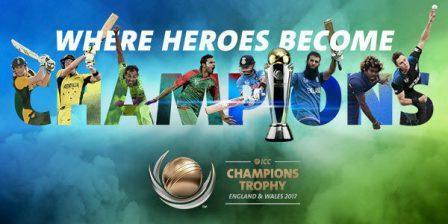 The ICC Champions Trophy is organized by the International Cricket Council and started in 1998. It was first known as the ICC Knock Out Tournament and started with the intention of it being held every two years. But that changed after it was delayed until in 2009 due to security reasons in host country Pakistan. It was moved to South Africa as a result and has been held every four years since then, like the World Cup. The number of teams that compete in the “One Day International” event also changed. At first, all 10 “full member” countries of the ICC were automatically invited to participate in the tournament, and then associate and affiliate members were invited. Being a “full member” means that your country has an official governing body for cricket and the operations of the sport in a country are up to the standards of the ICC. Nowadays, the round-robin and knockout ODI cricket tournament takes the top eight highest-ranked nations in the ICC ODI Rankings and pits them against each other to determine a winner. This year, the teams that qualified by ranking high enough as of September 30, 2015 are Australia, India, England, South Africa, New Zealand, Sri Lanka, Bangladesh and Pakistan. It’s Bangladesh’s first time in the tournament since 2006 after it replaced the West Indies to round out the top eight teams. Matches in the tournament are held over a period of about two weeks, and it starts with pool play. The eight teams are split into two pools of four with the top-two teams from each pool advancing to play in the semi-finals. The stakes are high in the tournament, as a country could lose just once and end up being eliminated. England is the host country for this year’s tournament, and it’s taking place around the country in three different locations. The biggest and one of the more prestigious venues is The Oval in London. It first opened its doors in 1845 and is located located in Kennington in South London. Normally, the facility plays home to the Surrey County Cricket Club and it’s typically the place where the final match of the English season is played. Although it’s mostly been known for cricket, it was the place where England played its first-ever international soccer match — against Scotland. That was in 1970, and then it hosted the FA Cup final two years later and did so again in 1874 and 1892. The Oval has endured plenty of redevelopment over the years and can now hold about 26,000 people. In addition to that venue, the Edgbaston Cricket Ground in Birmingham, with a capacity of 23,500 and Sophia Gardens in Cardiff (15,643 capacity) are also hosting matches during the tournament. Edgbaston is the home to Warwickshire County Cricket Club, while Sophia Gardens sees Glamorgan County Cricket Club play its home matches there. Because of the terrorist attack at an Ariana Grande concert May 22 in Manchester, security in the area was increased throughout the area. The ICC announced May 24 that it would have a thorough review of its security procedures at all matches. Believe it or not, the United States does have a cricket team, and it’s listed by the ICC as an “associate member.” The designation means that the U.S. is a country where cricket is “firmly established and organized,” but it doesn’t quality for full membership. Instead, it has to be promoted by the ICC. The U.S. debuted — and had its only appearance — at the ICC Champions Trophy in 2004, but it couldn’t make it out of the group play round. Being an associate member means that a nation must have at least 16 “senior teams” and 16 “junior teams” playing structured competitions in the country. In addition, the country must have at least eight cricket grounds — four of them have to be permanent. However, the U.S. is no longer permitted to compete in ICC play. The nation competes under the United States of America Cricket Association and became a member of the ICC in 1965. But its membership was suspended back in 2015 because of “significant concerns” over finances and governing. It was the third time since 2005 that the U.S. national cricket team received a suspension from the ICC. The ICC said it made its decision to suspend the USA Cricket Association’s membership because of the findings a review group made after researching the cricket activity level in the country. The ICC Board has made this difficult decision after careful consideration and in the best interest of the game and all cricketers in the USA. The country has tremendous potential but because of governance, financial and cricketing challenges, the opportunity to grow the game is not being properly nurtured. In order for the membership to the ICC to be restored once again, the USACA needed to show the ICC that it addressed its concerns. Most recently, the ICC said it is considering expelling the U.S. from the circuit. The USACA fired back at the ICC, saying in a May 2 statement that it should be reinstated instead. Of those countries, India has advanced to the final the most times with three, and Australia and India are tied for the most-ever finals victories with two — India was joint champions with Sri Lanka in 2002. In the most recent tournament in 2013, India was victorious against England. India emerged won the trophy over England by 5 runs, and Ravindra Jadeja was selected as man of the match. He also received the “Golden Ball” honor for taking the most wickets in the match. India is next in line to host the ICC Champions Trophy in 2021, but there’s talk that the tournament could be canceled in favor of a 2019 ODI League.